Lauren Arrington was in the process of trying to figure out her sixth grade science project when she noticed a lionfish while fishing in the Loxahatchee River in south Florida. Lionfish had been spotted in Florida as early as 2010 and have since spread to many of its waters. Surprised to find it, the 12-year-old wanted to see if a dead lionfish’s spikes would still be venomous. Her father discouraged her from the idea, unwilling to be a human test subject. The daughter of two scientists began to wonder how the lionfish was surviving in the river and decided to do some investigating. The results of her experiment would end up in a science journal and change the way scientists are dealing with a pervasive lionfish invasion in non-native waters. A native of the Indian and Pacific Oceans, the lionfish is relatively harmless in its natural habitat. Its prey consists of other marine animals in its environment. With a stomach that can expand to 30 times its normal volume, it can consume creatures that are up to half its body size and is only limited to prey that can fit into its mouth. Other species that include the lionfish as part of their diet include sharks, groupers, large eels and humans. The beauty of the lionfish’s long mane-like spikes makes it a favorite in exotic aquariums and belies their venomous nature. For decades, however, the lionfish has been on a path of destruction pushing our earth’s waters to the brink of an ecological disaster. 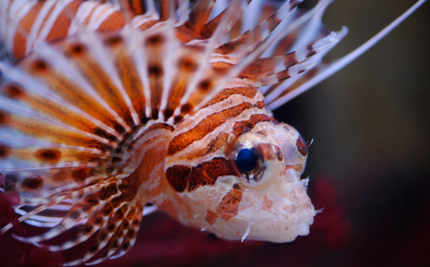 The intentional release of lionfish from home aquariums has put them into non-native waters in the Western Atlantic Ocean, the Gulf of Mexico, Caribbean Sea and the Mediterranean Sea. Prolific breeders with the ability to release up to 2 million eggs per year, the lionfish population has increased exponentially in just a few decades. They feed on marine animals that keep coral reefs healthy, as well as their eggs and offspring. Devouring the marine life in their environment is something a lionfish does really, really well. With the help of her father Lauren captured a few to take home to observe. She was aware of the lionfish invasion and decided to see in what conditions the lionfish could survive. She called her experiment Understanding the Limits of Lionfish Invasion. The hypothesis was that lionfish needed a certain amount of salinity in their environment. Scientists measure water salinity by the amount of salt found in 1000 grams of water. So if there is one gram of salt in 1000 grams of water, the amount of salinity would be expressed as 1 part per thousand, or 1ppt. The salinity of the area where Lauren found the lionfish is part of the Jupiter inlet that connects to the Atlantic Ocean and averaged the same ocean salinity of 35 parts per thousand. For two weeks, Lauren observed the lionfish’s food intake and stress levels as she reduced the salinity of the water. She believed that because of their natural ocean habitat, it would be unable to survive with a salinity of less than 13 parts per thousand. However, when that level was reached, there was no change in their behavior. She continued to lower the levels until she reached a salinity of 6 ppt. The lionfish survived. Lauren had discovered that lionfish can survive in freshwater. Her experiment got the attention of researchers at Florida International University and North Carolina State University. Due to the rules of the science fair, Lauren didn’t take the salinity any lower out of fear that the fish would die. Other researchers took the salinity to zero, discovering that the lionfish could tolerate a minimum of 5 parts per 1000 – generally the lowest salinity of most freshwater bodies. The discovery is significant because scientists have not thought to look for the dangerous predator in freshwater areas until now. This completely human-made threat of the lionfish to ecosystems and commercial fishing is now much greater than previous believed. They can be a threat in the freshwaters where fish nurseries are kept and feed on the eggs and juvenile fish. They could also be feeding on any number of freshwater species not previously known to be in danger. Not to mention, there are no natural predators for the lionfish in any of these areas. In response, the state of Florida has banned the import of live lionfish into the area as of August 1, 2014. They have also expanded the areas where people can legally spear the lionfish with a permit. Harvesting of the fish is also being allowed as part of the effort to reduce the population. Researchers have also put out an alert to be on the lookout for the fish in previously unexamined waters. Lauren’s research has since been peer reviewed three times. The results of the expanded study by Dr. Craig Layman, Chancellor’s Faculty Excellence Fellow at North Carolina State University, and Zachary Jud, a graduate student at Florida International University, was published this year in the journal Environmental Biology of Fishes. Lauren’s research was cited and credited with the initial discovery. Not bad for a 12-year-old whose research project earned her third place in a sixth grade science fair. Once again, we have enacted a law that negatively affects responsible aquarium owners because of irresponsible owners. Now, I don't think lionfish will go extinct any time soon (and I am amused that people are finding out ways to eat them), but laws like this are negatively affecting the long-term survival of truly iconic species, like lions. We need to deal with irresponsible animal owners without negatively affecting the responsible animal owners. Bravo to Lauren! I taught for 31 years and love a young people going for it. Learning is so much fun. Sorry, Care2 but you (and others) jumped the gun to give accolades to this child. The work was published 3 yrs ago by a marine biologist as part of his PhD. A friend of his supervisor pinched his work, and gave it to his daughter. Unless you think this 12 yr old wrote a PhD under a pseudonym when she was 9 yrs old. Either SHE is a FRAUD, or her scientific dad is a FRAUD. The exact research was done a few years ago, with the EXACT same result. Interesting. Although I really don't agree with traumatizing fish in order to find out their limits I do understand that these fish are a problem. I also wondering WHY people are allowed to release their pet fish back into the wild, not only does it cause problems like this but there is also the potential for the fish to be unable to survive in the wild. There is a lot of maintenance that goes into aquariums, especially salt water ones, in order to keep them in optimal condition for the fish to live...but nature isn't so closely monitored and fluctuation in the natural environment may prove too much for some fish to handle.